Hey pups! It's Steve! I wanted to share a picture with you. 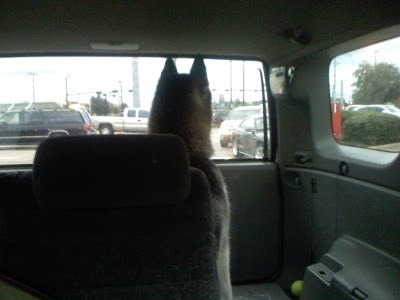 When I ride in the car with my mom and dad I like to sit in the back of the car and watch the other cars. Mom says that I'm being the 4Runner Tail Gunner. 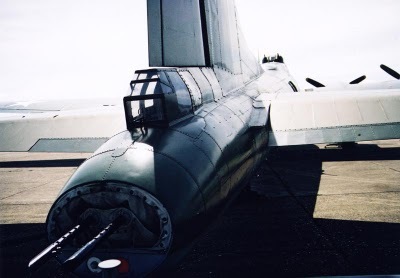 Back in World War 2, some airmen who flew on the B17 were given the job of tail gunner. 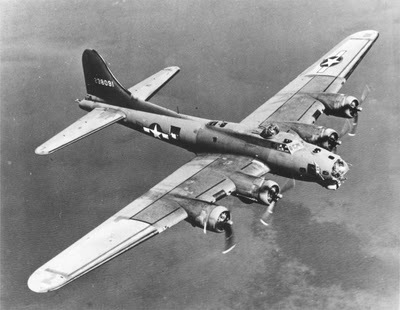 Here's a picture of the B17 Flying Fortress. If you look closely, you can see the machine guns sticking out the back of the airplane. Here's a close up shot of the tail gunner position. Here's me in position as the 4Runner Tail Gunner. Nobody messes with my 4Runner. As part of my trooper duties in the A04, I have to be on high alert for cats who try to hijack 4Runners. As you can see, I'm taking that task to heart. Oct 24 Come and Get It!